It is time to start planning our Holiday meals and of course we all want them to be the best and taste delicious and of course we want them to be healthy for our families as well. 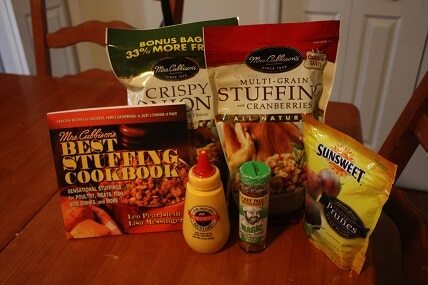 I recently received a package from Mrs. Cubbison filled with yummy croutons, stuffing and crispy toppings. All the things needed to add the extra touch to a Holiday meal. Mrs. Cubbison’s products are all natural and add tons of goodness to your holiday meals. All of their products are made from fresh breads and veggies which is important for those who want to have natural products on their dinner table. One of my favorite dishes during the holiday season is Greenbean casserole, I normally uses French’s onions when I make it but this year I am using Mrs. Cubbison’s Crispy Onions. One Luxury Living Frugal Style Reader will win a Holiday Dinner Gift pack from Mrs. Cubbison. Tell me which product you would like to try from the Mrs. Cubbison website. No purchase necessary, Open to US residents who are 18 years or older. This giveaway will end on December 20, 2011 at 11:59PM EST. Leave a separate comment for each entry method. Mandatory entry must be completed for the extra entries to count. This contest is not associated with the entry methods. All sponsors are responsible for fulfilling their prizes, we are not responsible for sponsors who do not fulfill their prizes. Winner will be selected using the “And the winner is plugin” and will be contacted by e-mail. The winner will have 48 hours to reply to the contact e-mail or a new winner will be picked. I would love to try the cheese and garlic croutons. Seasoned Corn Bread looks tasty! kristiedonelson(at)gmail(dot)com Thank you. Like LLFS on Facebook. Kristie Morrison Donelson. kristiedonelson(at)gmail(dot)com Thank you.